This high-performance module delivers over 35 dB of gain across the entire broad range of 5 GHz to 10 GHz with a noise figure of 2.5 dB (typ) and OIP3 of +21 dBm (typ). 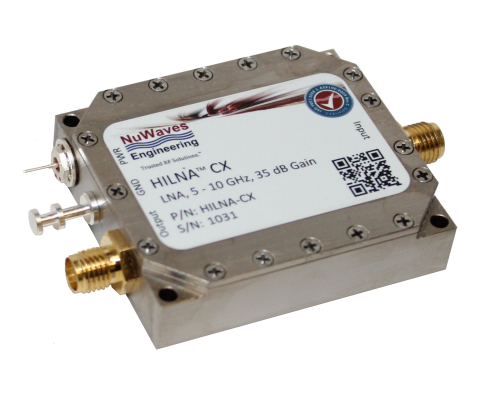 NuWaves’ HILNA CX™ is the latest addition to the family of HILNA broadband low noise amplifiers covering C- to X- band frequencies. This model features a miniature form factor of 1.2 cubic inches and weighs only 0.50 ounces, allowing ease of integration in space constrained systems. The HILNA CX s robust power supply also operates over a very broad range, easily allowing the unit to be integrated into systems without regard to power supply precision.